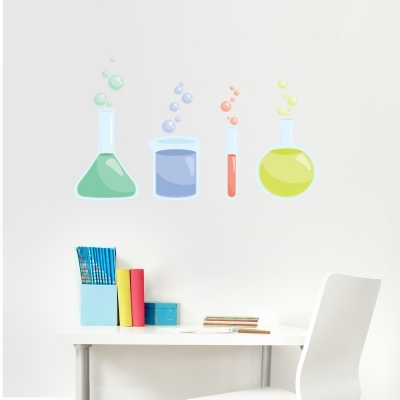 Now you can turn any room into a fun filled science lab! This Beakers Printed Wall Decal is repositionable and easy to re-use so you can enjoy these colorful beakers in any classroom, office, or bedroom. Beakers can be displayed as pictured or placed around a room. Please note that the dimensions listed are for just the beakers. Bubbles will add to the overall height. Unlike our solid standard vinyl decals, Wallums Printed Decals are made from ultra premium finely woven fabric that is repositionable, and re-usable. Perfect for renters, apartments, dorm rooms, classrooms and holidays. Our printed wall decals can last for years but are easily removable when you move or decide to change it up. Decal is printed on re-positionable wall fabric material that can be moved many times.